Behind the blog: “Nice dress! Thanks, I made it! !” – Nice dress! Thanks, I made it!! Hello! I’m Linda – the sewist behind “Nice dress! Thanks, I made it! !”, a sewing blog from the West Coast of Vancouver Island, B.C., Canada. Thanks for stopping by! When I’m not working, commuting to work, exercising, or spending time with family and friends … I’m sewing! I have the perfect set up for me in our cozy home … a sewing machine on a wheeled cabinet in front of a great forested view. Sewing is my time, along with trying to read novels while jogging on my treadmill! Come to think of it, the best Christmas present I ever received was home-made Barbie doll clothes (made with a real McCall’s pattern by my older sister!). They were complete outfits plus matching accessories – purses, shoes, etc. 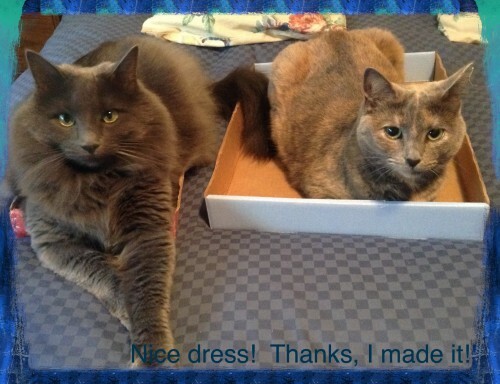 – each outfit mounted on cardboard, just like store-bought! They were Beautiful!! Another remarkable sewing memory for me was when I turned an ordinary Barbie doll into Queen Elizabeth the 1st for my school Social Studies project (I got an “A”!). Wish we had thought to take a photo of that project for my future blog! My Aunt was a seamstress, trained back in Hungary, and my Mother always had the sewing machine out on the dining room table, mending an old garment or sewing a new one. I’m not the only sewist in the family – maybe it’s in our genes? At the moment I have two toy VSM’s (a Necchi and a Singer) and these six VSM’s: Maria the Ford deLuxe (she still needs to be cleaned up), my yet unnamed White (needs a bit of work yet), Winnie the Singer 221 Featherweight, Amber the Singer 421G, Barbie the Singer 500 and Ilona the Singer 15-88 (She’s fine, although her treadle cabinet needs work yet!). I really, really would like to play with a Necchi still – someday the right one will find me! I also have a Janome 3160QDC and a Janome MyLock 334. Recently, I purchased a Janome HD3000 (We call her “Janie”) to help me out with my new bag sewing addiction. Yes, I enjoy all kinds of sewing, but lately I’ve been self-drafting patterns and sewing up various styles and sizes of bags – with an emphasis on using repurposed materials. I don’t really have anyone else to exchange sewing ideas with, so I was delighted when I snooped around on-line and found your inspiring blogs. You were all so supportive, friendly and fabulous to read, I just had to join the fun! I thank all you wonderful bloggers for giving me a chance to read about your ideas and plans and see your makes! Don’t forget … Nice dress! Thanks, I made it!! is the home of the DESIGNIN’ DECEMBER Challenge! Join in on the fun! Thank you very much for reading and commenting on my blog! And before you go, let me introduce you to my apprentices, Simon and Sophie! These are my original photographs, content and creations, unless otherwise indicated. If you use a photograph or any content from this blog, please link back and give proper credit. All rights reserved. Also, unless otherwise stated, I am not affiliated with any other person or company and all opinions given are my own. I use on-line courses a lot. We live in a rural area and actually attending a sewing class is not easy for me. On-line courses are easy to access. I also use books, other blogs, and on-line reference material. I’ll let you know every time I get information from somewhere else, in case you want to look it up too. I don’t receive any compensation. I just want to spread the information and education I have found. Copyright © “Nice dress! Thanks, I made it! !” 2013 – 2019.
you try to read novels while on the treadmill? I do too – haha, never really works, does it?! Well it was pointless with pocket books, even if I propped them up on the treadmill console… And it was difficult with hardcover books too… No matter what I tried either the book or I would fly off the treadmill! Now I prop my e-reader on the console and I do a bit better. I just have to make the font HUGE so I can see it when I was jogging! Trying to read sure makes the time fly though! I know this has nothing to do with reading books, hardcover or paperbacks, on the treadmill, but I tried to hold puny little dumbbells while walking on the treadmill…almost killed myself. Moral of the story, don’t do anything on the treadmill but watch TV! Don’t even blink! My eyes were tired this last week so I tried closing them while walking on the treadmill, glad I was holding on because it could have been really, really bad! OH OH, I’d say it’s time to give the treadmill a rest! question. I was given a my home 334d and it did not come with a manual. I have been trying to get the rolled hem setting perfect and its not happening. Can you share the perfect rolled hem setting for this machine please?? TYIA! Hello! At the moment I’m sitting here rushing through my lunch before I have to go back to work, thinking isn’t there something interesting that I could be doing right now – so I read sewing blogs and I come across your question! I would be happy to help, but I usually only post on Friday night or Saturday morning, so it will have to wait until then, so sorry! But I will see if I can get some photos together, or something, for the weekend post! Thanks for reading/commenting! Thank you! I love reading your’s too – your knitting especially is quite lovely! I shall go take a look at the information. Do you mean the PIN IT red and white button about your LIKE button? On my IPAD, which I am using now, it is in MENU, under Settings, and under Sharing. It is one of the enabled services. Then it has a bunch of questions about what you want to share with and how you want to share. I learned how to do it by Googling “how to get a PIN it button on my wordpress blog”. It’s amazing what you can learn about by googling it! Thank you for the kind words, by the way! Hello there! I just chanced upon your blog and I just want to say hello. Well hello to you too! I hope you can join in on the conversation sometime! Looks like you have a blog too. I shall go take a peek! Hello! So nice of you to introduce yourself! I always look forward to talking to people about sewing and such! Hi! I just found your lovely blog and had to read 1000 things….it’s been a long time, but I’ve done some of them….I was once a wiz with bound buttonholes. Don’t ask me why, just always loved them. Will be reading more of course, but wanted to greet you and let you know I’m now following! Thank you for saying Hello and the compliments. I have done welt pockets with some success, but not yet bound buttonholes – they strike me as similar though? I have checked out your blog and am following you too. Look forward to reading you! You won the sewing feet! So can you email me your postal address to xxxxxx please. A 334D is a step up from mine. Try checking out “Used Victoria” or “Used Nanaimo” to see what others are selling their machines for. I did just find one ad now on Used Victoria for a Janome MyLock 334D serger that said “…in excellent condition. Bought new at Sawyer Sewing centre and maybe used it 15 times. Paid over $700. Will include lots of spools of thread too. $325.” So that can give you an idea of the sale price. Put it on Used Nanaimo and see if you get any interest. Just found your blog, and I really like it. I too started sewing as a kid (9) and like you I don’t have sewing buddies to talk shop with. My husband says sewing makes him sleepy lol. But I have been studying sewing and crafts for decades and totally addicted to textiles, techniques and up cycling. I just hate when something “looks up cycled”. I’m a huge fan of couture and quality and really try to give my items “polish”. I also live in a more rural area (Pennsylvania) and so classes are a hassle to find, plus YouTube provides and it’s free, yay! Anytime you want to talk shop shoot me a line. Can’t wait to read the rest of your blog. Hello! Thanks for the compliment and the follow. I just went over to take a look at your’s and I like it. I’m following you too so I don’t miss anything. Thanks for stopping by!